On Monday the winner of this year’s Seimas election, the Lithuanian Peasant and Greens Union (LVŽS) and the Lithuanian Social Democrat Party (LSDP) worked on merging their programmes and decided on the number of ministries each party can expect in the future cabinet, with 11 going to the LVŽS and three to the LSDP. Currently there are 14 ministries, but in the future the Peasant Greens intend to merge the Ministry of Energy to the Ministry of Economy, the Conservatives had separated them apart in their earlier term. 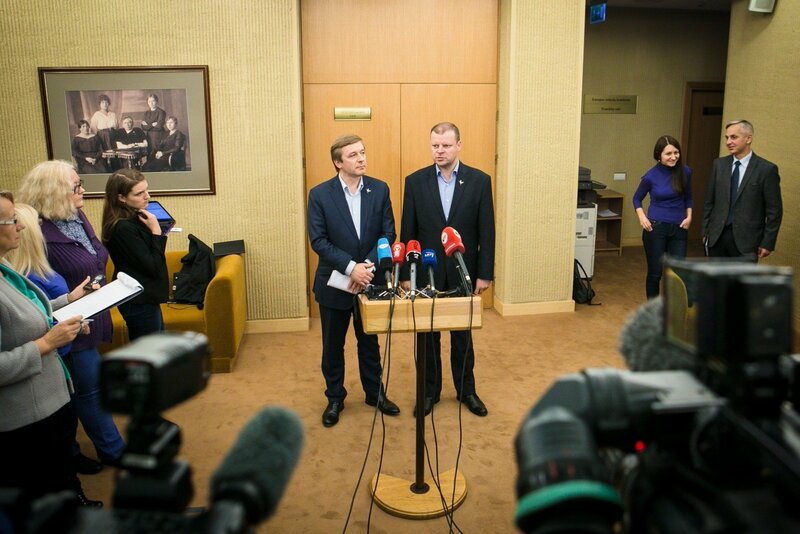 The Peasant Greens also intend to delegate Saulius Skvernelis to the seat of Prime Minister, while also intending to take the position of Seimas Speaker. The Social Democrats will be able to aim for 2 Seimas deputy speaker posts, with one being potentially in store for the SocDem leader Algirdas Butkevičius. It is believed that A. Butkevičius would prefer that one of his opponents, Gediminas Kirkilas, would not be granted to same position. Unofficial sources suggest that the Social Democrats can expect the Social Security and Labour, Justice, and Foreign Affairs ministries in the new cabinet. For now talks suggest that the post of Minister of Foreign Affairs could go to Social Democrat Linas Linkevičius, who has earned the trust of President Dalia Grybauskaitė. He was also identified as a suitable candidate by S. Skvernelis. The Ministry of Justice could be left in the care of Julius Sabatauskas, who is currently the chairman of the Seimas Law and Law Enforcement Committee. The Social Democrats paid particular attention to the Ministry of Social Security and Labour, but there are some ambiguities regarding it. A number of party members would like to see Vilija Blinkevičiūtė relinquish her post in the European Parliament and perhaps even become party chairwoman. This way two problems would be resolved – the party would have a new charismatic leader, while G. Kirkilas, who is frowned upon by Butkevičius would be exiled to the European Parliament. That said V. Blinkevičiūtė has stated in a live Delfi conference last week that she does not intend to work in the current cabinet. “We hope to convince her,” said one Social Democrat. The Peasant and Greens Union had already released its list of shadow ministers earlier. For example Stasys Jakeliūnas is proposed as Minister of Finance, Aurelijus Veryga as Minister of Healthcare and Kęstutis Navickas as Minister of Environment. Virgilijus Poderys is expected to become Minister of Energy, Mantas Katinas – Minister of Economy, Liana Ruokytė Jonsson – Minister of Culture, Vilija Salienė and Bronius Markauskas – Minister of Agriculture. The “Peasants” have not named a candidate for Minister of Transport and Communications, nor one for the post of Minister of the Interior. The latter is particularly important to S. Skvernelis, thus it is likely that this position will be given to someone close to him. “We did not encounter any issues that could halt the negotiations at this stage,” stated Ramūnas Karbauskis. 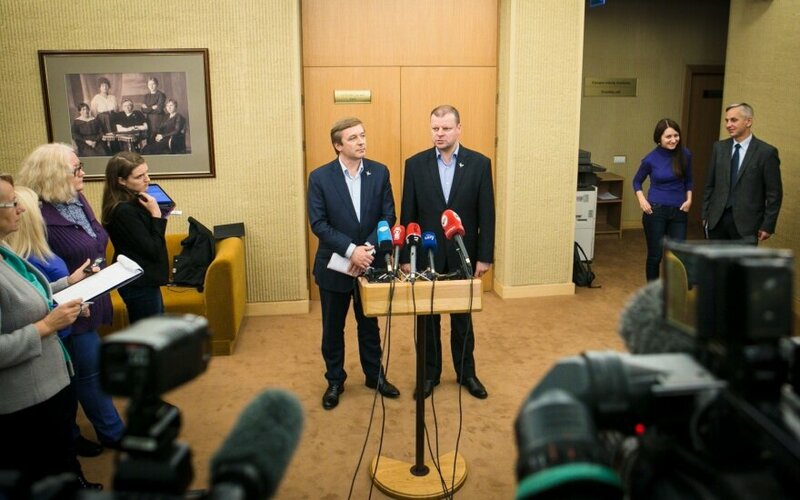 • The Seimas Audit Committee and Anti-Corruption Commission are to be led by opposition representatives. The Lithuanian Peasant and Greens Union (LVŽS) and the Lithuanian Social Democratic Party (LSDP) have agreed to postpone the implementation of the country's new Labour Code for half a year. "It [the code] will be delayed for half a year. It will be refined and should come into force after we discuss it with the Tripartite Council and adopt the provisions and decisions that will be acceptable to all parties," LVŽS Chairman Ramūnas Karbauskis told reporters after Monday's meeting between the two parties' negotiating teams. The entry into force of the entire package of laws, the so-called "social model", may be postponed as well. "This issue is clearly linked to the draft budget. We have to get all the information and we will decide then if it [the social model package] is to be delayed or some other option has to be chosen. The prevailing opinion is that it has to be delayed," Karbauskis said. "If arguments suggesting that we should act in a different way emerge during the deliberations of the draft budget, we will do so," he added. The outgoing Seimas in early November adopted certain amendments to the Labour Code in light of comments and proposals made by President Dalia Grybauskaitė in her veto message. The parliament earlier this year overrode the president's veto, but promised to take her proposals into consideration. In signing the coalition agreement, the Social Democrats intend to distance themselves from certain questions they are firmly opposed to. The SocDems are against any new artificial insemination initiatives, which oppose the fairly liberal current Artificial Insemination Law, they also leave themselves the right to a different opinion on various questions of human rights. The Monday meeting did not feature discussions of establishing alcohol sale monopolies, though the LVŽS Chairman R. Karbauskis stated that regarding this question, they intend to make constitutional changes. That said since amending the Constitution is a difficult task, Karbauskis did not dismiss the possibility of establishing specialised, but private alcohol stores. The LSDP and LVŽS are somewhat opposed in regard to direct election of prefects, the SocDems hold a fairly sceptical opinion on this. A. Butkevičius’ negotiation group does not favour moving several ministries to Kaunas since ministries are usually accompanied by a number of subordinate institutions. Delfi reminds that the Lithuanian Peasant and Greens Union won 56 mandates in the Seimas elections, while also inviting a number of independent members of Seimas into their fraction. The Social Democrats will have 17 seats in the new Seimas.